DDR Made Remote Control Ferrari 312 P.
This is a great remnant of the old DDR (Former East Germany)! 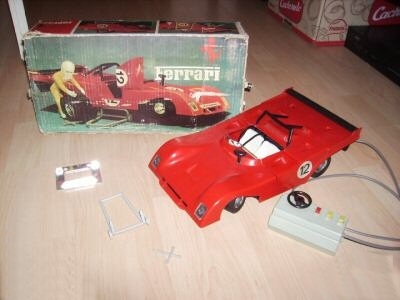 It is remote controlled (cable) Ferrari race car including its original box. It models a Ferrari 312P in red of which 12 pcs. were originally built in 1971 - 1973. The model itself dates from around 1975. The model has been tested on its functions and works great and the battery box is nice & clean.